When Jonathan Harris '02 travels abroad, he doesn't just follow a guide book and snap pretty pictures of the sites. He carries what he calls a "sketchbook," a bulky often-handmade journal with thick, unlined paper that holds his written impressions, mementos he picks up along the way, and his artwork. He filled 60 pages when he spent three weeks in Burma last summer. "If I didn't keep [a sketchbook], I wouldn't really enjoy traveling because so much of it is recording and digesting what I see," says Harris. He carries a set of watercolors with him everywhere. "The act of drawing focuses you in the present tense and really demands that you notice what's happening," says Harris, whose travel experiences and artistic ability helped spark a new magazine, Troubadour, which in a sense is an extension of his sketchbooks. When he returned to Princeton last fall, fresh from his summer travels in Asia and the previous semester studying abroad in Australia, he felt "shell shocked," particularly after traveling alone in Burma, where he learned straight from the people about its oppressive military regime. "I was a little bit unsure how to be with people again. I would find myself standing around my good friends and not having anything to say to them." Classmate Daniel Hafetz, who spent the fall of his junior year in Cape Town, South Africa, then traveled to Namibia, Zimbabwe, and Mozambique, also had difficulty fitting back into the college culture. Before long, Hafetz and Harris decided to start a magazine for students to share their travel stories. They hashed out their mission statement, gathered student editors, and started soliciting manuscripts and artwork. "Pretty soon it had taken on a life of its own," says Harris. Bursting with gripping photographs and beautiful illustrations, Troubadour is a literary journal aimed at promoting crosscultural awareness through the travel narratives of students, alumni, and faculty members. "Our interest is not with tourism," reads its mission statement, "but rather with how people understand themselves through where they've been." The inaugural issue published last January included an original poem by Paul Muldoon, a photographic essay of kids who live in trailer parks along Route 1 in New Jersey, a short piece by a student who volunteered with the Missionaries of Charity in Calcutta, India, and stories by Harris and Hafetz about their own journeys in Burma and South Africa, respectively. The magazine "allows students, faculty, and alumni to collaborate, side by side on the production of something that extends and reinterprets the definition of travel and the definition of art and literature and allows people like Paul Muldoon to publish alongside potential great writers of tomorrow," says Harris, who spends up to five hours a day working on the magazine. "We didn't know what was going to happen," says Harris. "We just threw it out there." They accepted no advertising, relying instead on a few donors and university departments to cover the cost of production. After its successful reception, the editors are starting to think bigger. "Faculty came to us and said this could be something that if taken to the next level, could redefine Princeton as a place known for its literary and artistic merits and not just for its Woodrow Wilson School, accounting courses, and investment-banking track." The second issue, which came out May 6, focused on "all things international" but also on helping Americans reinvision their own backyards, says Harris. The issue featured a photo-essay on a community for the handicapped in New York, a poem by Yusef Komunyakaa, and a study of the memorialization of Leo Tolstoy's house in Russia. Harris and Hafetz plan on staying with Troubadour next year and hope to see it grow beyond Princeton, but at the same time keeping its university ties. Harris would like to see the magazine distributed in secondary school libraries and used as a teaching tool for social studies teachers. 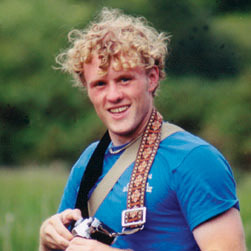 A computer science major, Harris not only designed the magazine but also Troubadour's unusual Web site (http://www.troubadourmagazine.org). He's been designing Web sites for several years. His clients include a historic Bed & Breakfast in Massachusetts and consulting companies in New England. Next year he will continue his freelance Web design business to make ends meet. All this from someone who before coming to Princeton had sent a total of three emails, from a borrowed account. "I took the basic introduction to computer science course that's designed for lacrosse and hockey players," says Harris. But he soon discovered he had a knack for design. For his senior thesis, he developed Extra Extra! (www.cs.princeton.edu/~jjharris/thesis), a Web site that collects similar news stories from foreign newspapers so a user can read different perspectives of the same event. Although he didn't fiddle with computers until going to college, Harris has been fiddling with paper and paints since he was a little kid making his own cartoon characters and comic strips. "I've always loved creating things," says Harris, whose single in Edwards Hall is decorated with his watercolor and oil paintings, photos from Burma and Vietnam, and a scarf from Vietnam, among other treasures.